If you’re looking for the perfect home improvement package, consider updating your roofline. Installing brand new guttering, fascias or soffits in your home can liven up your property. Since these products are constantly exposed to the elements, you want rooflines that are able to maintain their structural integrity through all weathers no matter the time of year. Bluemanor Windows have been providing a brilliant selection of roofline products for over 20 years. We can therefore guarantee a FENSA Accredited installation process that ensures that your home remain leak free. 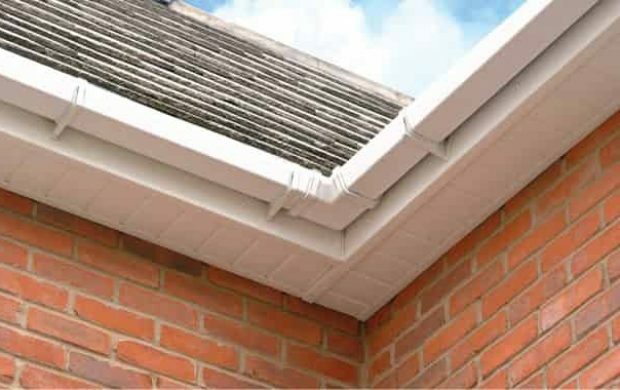 Furthermore, our fascias, soffits and guttering are beautifully designed so that you benefit from both glamorous aesthetics and durability. All of our double glazing options are installed by a fantastic team of professionals, well-trained in their craft. Boasting a number of qualifications in tandem with hands-on experience, they will complete your project quickly and efficiently. We offer this incredible product range to homeowners throughout Chelmsford, Bishops Stortford and other areas in Essex and beyond. Fascias - An integral player in the design of any roof, the fascia is responsible for mounting the guttering to the property itself. It is therefore important that this particular aspect of your roofline be structurally sturdy and resistant to fluctuating weights and temperatures. Soffits - Easily forgotten due to its placement underneath the roofline, the soffit serves as the first barrier between your rafters and the outdoors. These must therefore be designed with the latest weather-proofing techniques in mind, and should also look the part as well! Guttering - Perhaps the most recognisable part of any roofing product, the guttering serves as a narrow channel designed to redirect the likes of rainwater and other liquids. The constant interaction with rain inherent to these products means they must be durable and water-resistant. All of our uPVC roofline products are specifically designed with eco-friendliness in mind. One of the ways that we guarantee this is by utilising recyclable uPVC materials during construction. Nearly 84% of the weight of our guttering and piping is made up of recycled material, helping you contribute to a greener planet. The amount of energy it takes to manufacture guttering and other roofline products from recycled uPVC is tiny in comparison to the energy used to produce raw uPVC. This amounts to around a 70% saving in CO2 emissions during their production compared to non-recycled uPVC products. While it is understandable that the prospect of new fascias, soffits and guttering can seem like an expensive option, Bluemanor guarantee affordable prices. We make sure to offer roofline products that suit every budget, without any sacrifice in quality. As a local business, we are passionate about bringing high-quality products to all of our neighbours throughout Essex. Each of our uPVC rooflines are designed to adhere to all building regulations, and will continue to benefit you after installation with cost-effective properties. Our weather-resistant profiles easily maintain their attractive designs no matter the odds. These products will therefore save you money on both maintenance and energy bills by resisting damage and retaining heat. Our fascias, soffits and guttering outperform the competition when it comes to self-sustaining designs. Our products are more durable that competing timber rooflines, a characteristic that also makes them incredibly cost effective. Their longevity means that you don’t have to worry about replacing your new purchase any time soon, saving you money on maintenance. Furthermore, these brilliant products require little-to-no maintenance during their lifetime. Specifically designed to be rot, warp and flake-resistant, Bluemanor double glazing stands the tests of time, and the occasional wipe down is all that's needed. Our experienced workmen will also ensure that the eaves of your property are cleaned before your new guttering is fitted. If you think that our uPVC roofline products sound like the perfect fit for your Essex home then get in touch with our specialist team today. One of our trained support agents will be more than happy to answer any questions that you may have about our products or your home improvement project. On the other hand, if you would prefer a bespoke roofline price right now you can check out the online quotation tool here on our website. This fantastic program is easily the fastest way to get a personalised price specific to your exact needs. Contact Bluemanor today for the optimum roofline.